If you've been to one of our iconic Pacific Northwest peaks, chances are you've signed a summit register. Learn the fascinating history of these relics of the past. I heard the buzzing first. As we were placing our signatures back inside the summit canister, an unfamiliar noise tickled my eardrums. The hair on the back of my neck stood up, and I could see the hair on my partners’ heads rising to the sky as if to kiss an invisible balloon. I spun frantically searching for the source when it dawned on me: it was us. We were buzzing. Our ice axes and skis and the metal zipper pulls were vibrating in unison. I didn’t know what was happening, but I knew it was time to move, and fast. We should have noticed the signs of the coming storm, but the trip to tag Little Devil Peak in the North Cascades in April 2012 had been, so far, a pleasant affair. We’d camped under clear skies and awoke to high clouds. As we neared the summit in mid-afternoon, we were suddenly engulfed in your classic Pacific Northwest weather - gusting wind, driving rain, and disorienting fog - all hiding the ominous clouds from view. The buzzing, I would later learn, is caused by ambient static energy from an electrical storm. Crackling, hissing, humming, or buzzing noises are indicators of a possible lightning strike. In the best-case scenario, like ours, you get to lower ground as quickly as possible. In less friendly situations, you want to drop your metal gear and get as far away from it and as low to the ground as possible. Our situation was scary, and we were lucky. I had never experienced this phenomenon before, but the trip was full of firsts for me. First time snow camping, first time planning a multi-day trip, and first time writing my name in a summit register. Cairns and Canisters and Registers, Oh My! Explorers have been leaving signs of their presence on our peaks since the dawn of adventuring. 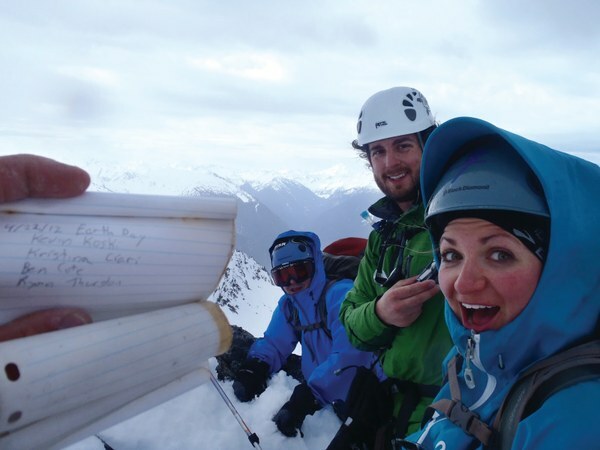 Methods for marking a summit conquest have evolved through the years. Early explorers built cairns or left flags marking their achievement. 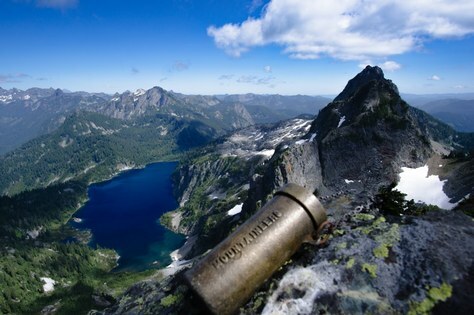 Today’s summiteers take photos to share on Instagram and check-in through geocaching websites. The history of summit markers in our area is as storied as it is long. In researching this article, I learned a lot about summit registers and canisters and how they evolved over time. First, a point of clarification: the term “summit register” usually refers to the “document” containing records of who has reached the summit. This is the thing that you sign, ranging from loose pieces of scrap paper to formal printed and bound ledgers. The “summit container” is the item holding these documents. When you reach a summit today, you’ll find a variety of summit markers. Many impromptu canisters still remain on our peaks. Less effective canisters include a whiskey bottle (the paper has expanded and won’t come out), spice jars (won’t fit a pencil), soup cans (don’t seal), metal cigar containers and band-aid boxes (prone to rust), and film vials (popular in the 90s; always wet). The best canisters, as trial and error has proven, are tubes — specifically tubes which minimize moisture while offering drainage and ventilation while being big enough to access the register without destroying its contents. And these are what you will most commonly find on peaks - both in historical brass, and in modern plastic. A committee of which Mr. Redick H. McKee was chairman was appointed to investigate and make recommendations with reference to some kind of weather-proof record box to be placed on the tops of mountains. The result of the committee’s efforts was the purchase of eighteen cast bronze cylinders, each 1.75 inches in diameter and 7 inches long (inside measurement), with a hinged flap top fastened down by a heavy brass wire ball, and having attached to it six feet of brass chain for anchoring to the rocks. Each cylinder has a number stamped on it, and in raised letters along one side is the word “Mountaineers”. Inside of each is a book on which those who climb the mountain may record their names and addresses and the date. The committee commissioned 18 brass tubes in 1915, then a second run of 18 more in 1919. These tubes were numbered 1-36 and placed on the most popular peaks in Washington, including the ‘six majors’. One tube, #8, was placed on The Tooth and later appeared in a film called “Ascent of the Tooth”, featuring Jim Crooks and Fred Beckey. Both men, with Fred in the red hat, can be seen signing the register, and rappelling from the summit using the hair-raising dulfersitz method. 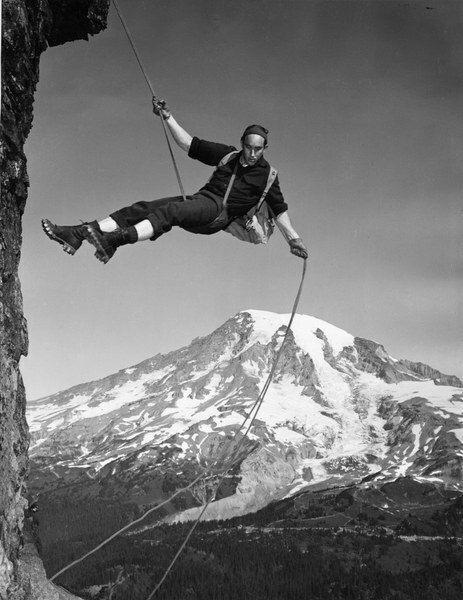 Walt Gunnason showing the dulfersitz rappel method in a photo taken on Pinnacle Peak, near Mt Rainier, circa 1950. In the 1930s, Mountaineer and REI co-founder Lloyd Anderson fabricated more than 100 additional tubes. Unlike the originals cast in brass, Lloyd’s “second issue” were fabricated from off-the-shelf plumbing materials (like heavy gauge pipe and fittings), with “Mountaineers” and the canister number hand-stamped into the pipe. These tubes were then distributed by hearty Mountaineers. It’s interesting to note that Lloyd also fabricated “lightweight private issue” tubes - their eventual destination unknown. The history of summit markers was left undocumented by the club until Mountaineer Don Goodman took up the cause in the 1980s. In December 1982, Doug pitched a “Proposal for the Establishment and Maintenance of Summit Registers in Washington State” to the Board, who approved $1950 to fabricate 200 tubes and print 300 register books. He’d been working on this project with a committee formed to work on the project for two years already. “There was a great debate on the material to use, the various properties of metals and plastics, preliminary designs, etc.,” said Don, recounting the ordeal. Interestingly, only about 20% of the tubes assigned to various peaks made it to their intended destination. A handful of those successful tubes were delivered by esteemed Mountaineer Fay Pullen. Little Devil register with Fay Pullen's signature. Photo by Kevin Koski. 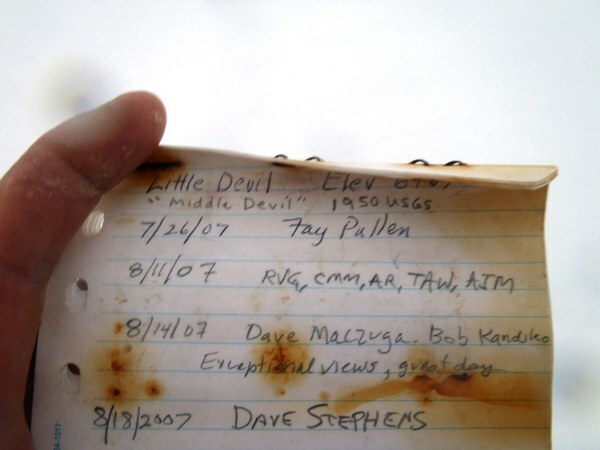 I didn’t know it at the time, but when I added my name to the register on Little Devil Peak, I was weaving my history to that of PNW legend Fay Pullen. The first woman and fourth person to complete the 100 tallest peaks in Washington by the 400-foot prominence rule, Fay has stood atop the summit of Washington’s most obscure peaks. She was also the 25th person to complete the Bulger 100 List and can remember signing a handful of original registers from the early 1900s. Each time we venture into the outdoors, we share new and different experiences. If we’re lucky, we learn something new about ourselves, our landscapes, and those who came before us. I’m grateful to Fay and all the mountaineers for preserving this rich history of exploration. Thanks to them, you can add your own name into the fabric of our shared history. All you have to do is explore the freedom of the hills on an obscure peak in our PNW and revel in the stories and names of those who came before. Kevin Koski (hand), Ben Cote, Ryan Thurston, and Kristina at the top of Little Devil. Photo by Kevin Koski. Special thanks to Don Goodman and Fay Pullen for contributing to this piece, and to Mountaineers history buffs Lowell Skoog, Milda Tautvydas, Mike Torok, and Monty VanderBilt with their help researching this article. For more information on Fay, check out our December 2012 Mountaineer magazine online in our archives at mountaineers.org. We’ve also shared the “Ascent of the Tooth” video, where you can see Fred Beckey’s spicy 1940s rappel, on our blog. If you find a full register on your climbs, you can turn it in to The Mountaineers Seattle Program Center and our history committee will make sure it is archived at the UW Special Collections library. This article originally appeared in our July/August 2015 issue of Mountaineer magazine. To view the original article in magazine form and read more stories from our publication, click here. In the print edition of the magazine, we mistakenly identified the person on rappel as Fred Beckey. The climber is actually Walt Gunnason showing the dulfersitz rappel method in a photo taken on Pinnacle Peak, near Mt Rainier, circa 1950.